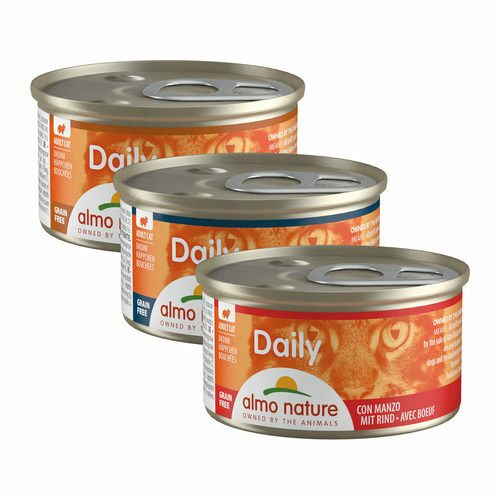 Almo Nature - Cat - Daily Menu Blocks is a tasty wet food for your cat. This cat food consists of delicious meat or fish with tasty vegetables, rice and egg. This cat food is free from artificial colourings and preservatives. Your cat will really enjoy these delicious meals. Almo Nature Daily Menu Blocks are delicious meals for your cat. This food contains tasty meat or fish with egg, vegetables and rice. This cat food is also free from artificial colourings and preservatives. Your cat will really enjoy these delicious meals. The Almo Nature Daily Menu Blocks are available in 3 different sizes: beef, trout or turkey & duck. Beef: meat and animal derivatives (beef 4%), minerals, vegetable fibre extracts. Turkey & Duck: meat and animal derivatives (turkey 4%, duck 4%), minerals, vegetable fibre extracts. Trout: meat and animal derivatives, fish and fish products (trout 4%), minerals, vegetable fibre extracts. Have you used Almo Nature - Cat - Daily Menu Blocks before? Let us know what you think about this product.